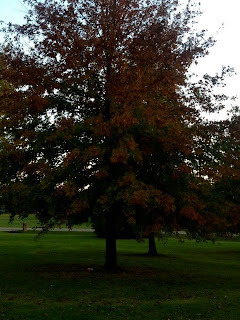 It's been almost two years to the date that I was awestruck by a beautiful tree changing leaves and wrote a blog about it. Two years ago I was full of grief over the impending death of my mother. Today, I am full of grief over the death of my marriage. Today is, was, I hoped would be, would have been my 23 year wedding anniversary. Maybe it still was since the judge hasn't officially stamped the marital dissolution papers yet. (Isn't that such a polite term for such a horrid thing?) It doesn't matter either way, the marriage is over. I have been told it many times. It's just taken me almost three months to believe it myself. Almost 23 years of believing we'd be the old people telling our kids and grandkids to just love each other and make it work vs three months of being told it's over and can't be fixed. The cruise we'd been planning to celebrate 25 years is never going to happen. Here, sign these papers and walk away. I haven't been sleeping well these past few months and I refuse to take sleeping pills. Mostly because I still have six kids depending on me and I need to be alert for them. But also because there have been a few times I wouldn't trust myself with those pills in the house. Last night was no exception. I was exhausted from another round of bronchitis and an extremely busy day, yet I woke up at 4am with a version of a recurring bad dream I've had since the beginning of all this. And I sat there in the dark and cried. I finally fell back asleep, and woke up at 7:30am still crying. A couple of the younger kids crawled into bed with me then and their love calmed me down enough to help me face this day. As the rain cleared later this morning, I walked outside and saw the tree in our front yard. Obviously I see the tree everyday and it must have been changing colors for the past week. But today it really hit me. It really was beautiful. And it really is dying. I remembered the dharma talk from two years ago where I learned that a tree changing colors is really a tree that is dying for the winter. And once again I started to cry. I feel like that tree. I, too, am dying in preparation for this winter. Logically I know that no matter how brutal a winter we have or how difficult an adjustment I will have in my new life, I do know that spring will eventually come again. New buds will bloom and life will return. Many around me have told me eventually I will also re-bloom more vibrantly and colorful than before. I believe them. Mostly. I just can't see it myself yet. I have no idea what my new life will look like or even what I want it to look like. I've been focused on one vision for 23 years. I don't yet know how to change that vision. Right now I'm dying inside and instead of dropping leaves I'm dropping tears. I don't feel beautiful like the tree. I feel ugly, sad and unwanted. Spring feels like a long time away. I know you feel that way, but luckily you have enough friends and family to tell you as often as you need to hear it, that you are beautiful, and everything, one day, will be ok. i know you don't feel strong or confident in yourself right now, but one day you will look back and say, "I'm okay, I survived." Your a surviver Jen. You are strong. You are beautiful. You are alive. And unlike the tree, you aren't dying, you are hibernating until you are ready to blossom again, and when you are ready, it is going to be spectacular. I love you, and I can't wait to see it. I feel very connected to the life cycle of trees: their death, their winter rooting & nourishing, and rebirth. Winter is an important time for all of us to reconnect and feed ourselves so we can come back stronger and more vibrant. Sometimes our metaphorical winter takes a while and it doesn't seem like spring will ever come, but it always does. You will feel whole again, and you will be more radiant than before. One second, one minute, one hour, one morning, afternoon or evening and then one day. One day at a time. Baby steps. Allow yourself to grieve. It sounds like you are in step two or four, they are kinda similar but different. Anyway, just be yourself, if you need to wallow, well then, WALLOW! If you need to scream, go for it (I'd do that one away from the kids and pets). If you need to sob, soak your pillow with your tears. Just remember that standing by are people who truly care about you and only what is best for you. Hi honey, you don't need to know what you want or have a vision for your future, you just have to have a desire to want a future. Maybe time to start a gratitude journal where you can only list the positives in your life so you can re-read it any time you need to be reminded of all the beauty in your life? I always find that helps in troubled times.